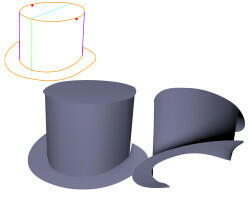 Abstract : Developable surfaces are surfaces that can be unfolded onto a plane, without distortion, and are widely used in industry We propose an end-to-end system for the interactive modeling of developable objects from a single annotated photo, restricted to the case of symmetrical objects made by assemblies of planes and generalized cylinders. Our method is in two parts : we first analyze the 2D annotated photo to extract the location of symmetric points and the rulings of the cylindrical regions. Then we use this 2D information in a global system to lift the shape of the object in 3D.